The Marquee guitar was developed as a budget version of the successful Custom series Hank Marvin Guitar, keeping as many of the original features as possible. This guitar has won high praise in the European press and was awarded Guitar of the Year in 1999 and 2000. It is by far the best-selling guitar in the Club series. You can visit Guitar Interactive magazine's review of the Burns Marquee Pro by clicking here. The King Cobra, a guitar that pushes that model's specifications significantly further and you get a bound Indian rosewood fingerboard with block inlays, a hard-rock maple neck (with a scarf joint only as part of the headstock), locking tuners, and a proper alder body. You can also have a tasty Canadian maple flame top just like the one on our review guitar. You can visit Guitar & Bass magazine's review of the King Cobra by clicking here. If you're in Shanghai this week, pay a visit to the Farida/Burns booth (Hall E5, E12) and catch The Beijing Beatles playing Burns guitars as part of the ongoing British Retro Invasion. On stage 3.30pm Thu-Sat, 12:30pm Sunday. Venue: Shanghai New International Expo Center (2345 Long Yang Road). The Expo Center is 35 kilometers from Pudong International Airport in the east, 32 kilometers from Hongqiao Airport in the west. If you're coming by metro, please take line 2 or line 7. Britain's most iconic guitar brand used by almost everyone in the 60s including The Shadows, Elvis Presley, George Harrison, and Jimmy Page plus more recently by Marc Bolan, Brian May, Mark Knopfler, Tom Petty, Oasis and Supergrass  to name but a few. Said to be the most user-friendly electric 12-string on the market, the Burns Double Six is also a piece of guitar history. Elvis had one and so does this issue's interviewee, Wishbone Ash's Andy Powell! So how does Burns stack up in the world of electric twelves? Tom Quale finds out. You can visit iGuitar magazine's review of the Burns Double Six by clicking here. Note: Please click on the arrow in the top right for the full story. The Double Six from Burns is a 12-string with a distinct look and sound. A greenburst finish on both the artful basswood body and maple neck reflects Burns' legendary style. Tri-sonic pickups offer their wide frequency range and low noise which results in clean note definition and plenty of Burns sustain. Plus, the Burns Double Six has wider string spacing for easier chording and room to let the octave strings sing. You can visit ProGuitarShop's Burns Double Six - Greenburst review and video by clicking here. Danni Nicholls - Brighton-based singer-songwriter, music promoter and all-round good gal - has a cute little Burns, a short-scale jazz guitar made in Britain. Story goes that it once belonged to Brit rock'n'roller Billy Fury: "My uncle bought it off a guy in the late '60s who said he was a friend of Billy Fury's", she says, "and that he had bought it off him. There's no hard evidence but that's the way the story goes!" One of the budget models in the Burns range at the time (it's a model built 1962-64), it's not worth vast sums to a collector (unless it could be proved to have been Fury's), but the guitar tech reckoned that its "build quality and playability is quite amazing". You can visit Danni's website by clicking here. Swedish company Amtech concentrates on computer and hi-tech activities, but dabbles in the music-making industry via a couple of echo units aimed mainly at guitarists. 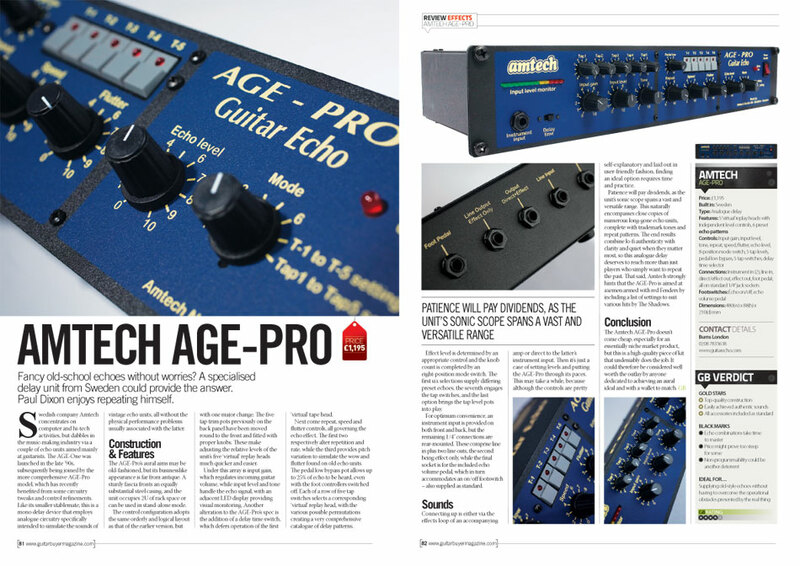 The AGE-Pro's aural aims may be old-fashinoned, but its business-like appearance is far from antique. A sturdy fascia fronts and equally substantial steel casing and the unit occupies 2U of rack space or can be used in stand-alone mode. The latest cost-conscious Cobra boasts a new version of a classic Burns single-coil. Paul Dixon practises some scales and turns on the charm. The Cobra name dates back to 1998, appearing on the least expensive electric in the UK-origin Burns range. Fast-forward to 2004 and the Cobra makes a comeback, joining the cost-conscious Club series introduced five years earlier. Launched in 2010, the latest version maintains the same design, but now boasts Burns' latest pickup: a downsized version of the company's classic Tri-Sonic single-coil. This is an article written for Burns' 50th Anniversary and designed for Modern Player Magazine in Chinese. Gaz Coombes has used a wide variety of guitars during his career, including a Burns Custom Legend, Fender Telecaster Deluxe and Telecaster Plus, and Gibson ES-335s, Les Pauls and SGs. Unfortunately, Cornfield can't remember exactly what guitar(s) Gaz Coombes played on 'Richard III'. Indie dance trio Friendly Fires think thy've found the key to recording an album that's thrilling enough to top the slow-burning success of the Mercury-nominated 2008 debut: boredom. Founded in 1960 by Jim Burns, a man often described as the 'British Leo Fender', Burns Guitars were a force to be reckoned with throughout the early 60s. The company was later sold to the Baldwin Piano and Organ Company of Cincinnati in 1965, and the original Burns guitar line subsequently came to an end in 1970. Following several attempts to revive the brand over the years, it was Barry Gibson who successfully restarted the company in 1992. The story goes that when Macca and co went into Abbey Road Studios to record the 'Paperback Writer' sessions on 13th April 1966, they were looking to experiment with a new bass sound. At the time, the group were said to have been listening to Wilson Pickett, Marvin Gaye and other Stax recordings, where the bass content was a lot stronger and often at the forefront of the mix. So when the Fab Four arrived at Abbey Road they had some new instruments, possibly borrowed or more likely hired from Burns London or Sound City as both were well known for gear hire. Ever since Barry Gibson successfully relaunched the Burns brand in 1990, we've seen the reissue of various instruments from the original Burns catalogue. The Nu-Sonic is the latest arrival and coincides with the company's 50th anniversary. First launched in 1964 as a follow-up to the Burns Sonic, the Nu-Sonic bass was marketed as a budget, mid-range instrument that was very light, with a short 30-inch scale length. Barry Gibson's love affair with Burns guitars began in the 1970s, a time when he still entertained ideas of 'making it' as a professional musician. "I was trained as a cabinet-maker but I was also in a band back then," he recalls. "I had an original Burns Marvin, a Bison and a Nu-sonic. They were the only guitars that I used in a 12-year professional career." Burns can legitimately lay claim to being the best-known British guitar brand and this year sees the company celebrating half a century since the name was officially established. The occasion is being commemorated by various limited edition instruments, including the Dream. Arguably the best-known name among UK-made electrics, Burns has now been around for 50 years, having been officially established way back at the start of 1960. Click for the the full article on the convoluted history of the country's most enduring guitar marque. It makes for interesting reading. ...Burns and Fender favour Gotoh's clever and compact 12-saddle style, which has become the industry standard for providing individual intonation adjustment of all 12 strings. Click for the magazine's review of the Burns Double Six. 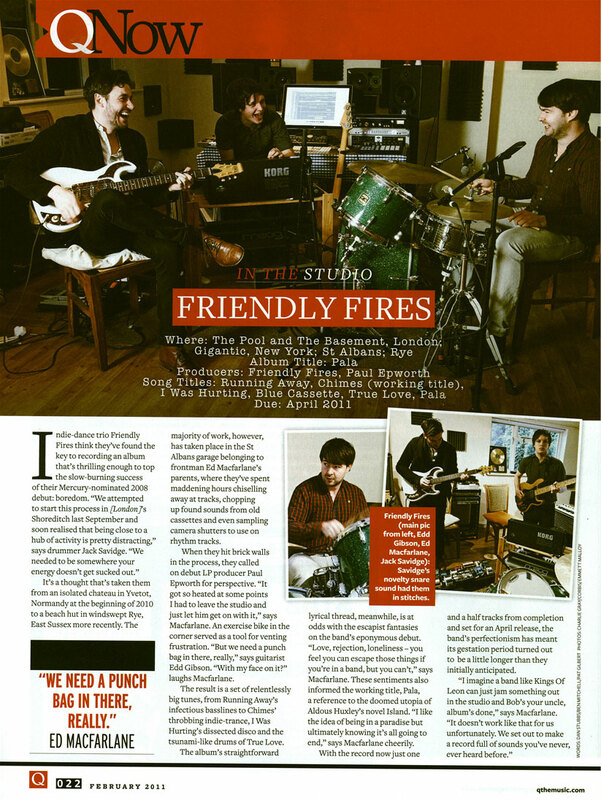 The magazine's verdict in the review is that the Burns Double Six was the Guitarist Choice. Launched back in 1964, the Burns Marvin was designed to meet the needs of Hank Marvin, lead guitarist with British instrumental group the Shadows. Taking Hank's Fender Stratocaster as a point of departure, the new model incorporated various 'improvements' including Burns' new Rez-o-Tube vibrato unit and Rez-o-Matik pickups. Last year saw Shadows guitarist Hank Marvin renew his association with UK maker Burns via the 40th Anniversary Marvin, which commemorated the introduction of his original signature six-string back in 1964. Now comes a variation that incorporates some modernised features approved by both Hank and his fellow Shadow Bruce Welch. Het is begin februari, maar het voelt als kerst. Buiten sneeuwt het zachtjes en de koerier belt aan bij De Bassist-vintagekenner Chris Dekker met een enorm pak in zijn handen. Inhoud: de Burns Shadows Bass, een getrouwe replica van de bas van John Rostill, bassist van The Shadows. In zusterblad Musicmaker is hij al vaker besproken: James Ormston Burns. Jim Burns was een legendarische Britse gitaarbouwer die in de jaren '60 zijn tijd ver vooruit was met zijn experimenten in gitaartechnologie en -elektronica.